You are likely familiar with the cosmic microwave background. This background is a thermal remnant of the big bang. Because of the expansion of the universe, this remnant energy has a temperature of about 2.7 K, which means it exists primarily in the microwave wavelengths. We see this cosmic background as a diffuse, low-energy glow of microwave radiation. 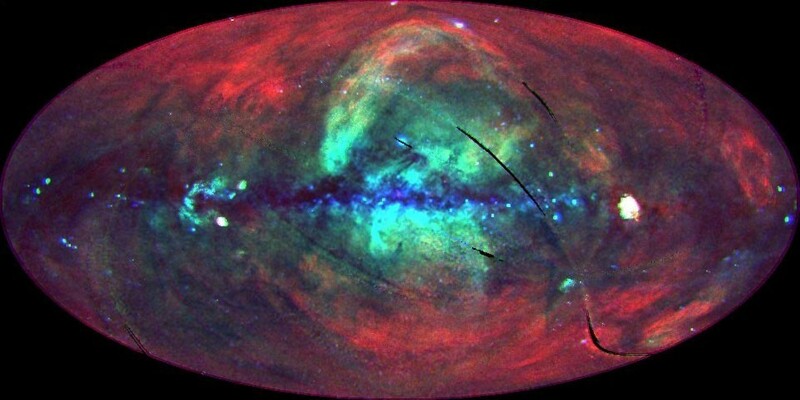 But there is another background that exists, known as the cosmic x-ray background. Just as the cosmic microwave background is a diffuse microwave glow, the cosmic x-ray background is a diffuse x-ray glow. You can see an image of this x-ray background in the image above. It is a false-color image, where red, green and blue represent low, medium and high x-ray energies. Unlike the microwave background, the x-ray background is not a remnant of the big bang. Instead it is generated through several processes. Most of the background is produced by localized sources such as active galactic nuclei, but other sources are the the local bubble of interstellar media that surrounds the Sun and other stars in our local spiral arm of Orion. But there is a small portion of the background that remains unexplained. One of the difficulties in understanding the x-ray background is the sheer challenge of observing x-rays at high resolution. X-rays tend to penetrate materials, so you can’t simply make a mirror to focus x-rays the way we do visible light or radio waves. X-ray telescopes must have special materials to reflect x-rays, and they need to have a very long focal length.